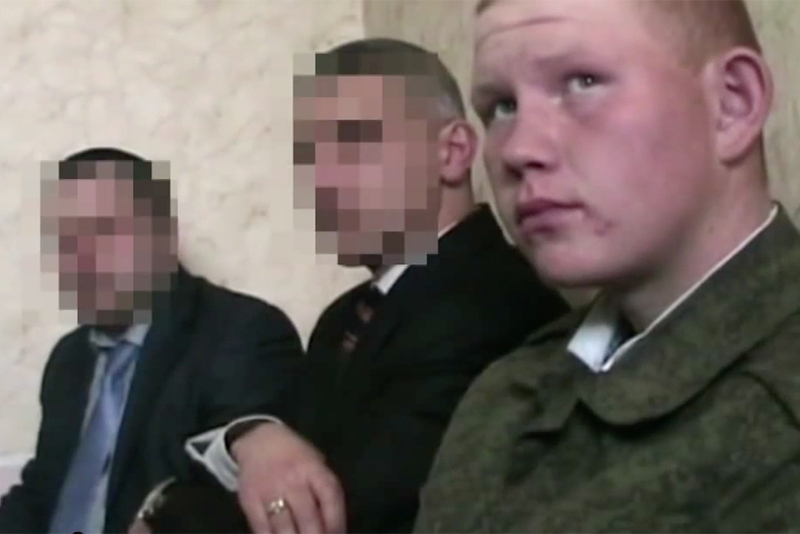 Two weeks after the killing of a family in the northern Armenian town of Gyumri, there are more questions than answers concerning the actions and motives of the individual accused of committing the mass murder, 18-year-old Russian army private, Valery Permyakov. Some answers may seem straightforward, while others, given the case’s sensitivity, may never be disclosed by Armenian and Russian investigators. According to the official charges against him, Permyakov entered the Avetisian household in Gyumri in the early morning of January 12, supposedly seeking a drink of water. He allegedly shot or stabbed to death all seven members of the family; supposedly from fear that the Avetisians would inform the 102nd Russian army base in Gyumri that he had deserted. Six died on the spot; the seventh victim, six-month-old Seryozha Avetisian, died on January 19. A Russian military tribunal in Armenia will try Permyakov, but the name of his lawyer -- a Russian citizen who lives in Armenia -- has not been disclosed, according to the Russian news service Interfax. Both countries have set up parliamentary commissions to monitor investigators’ work, and officials from both countries have repeatedly pledged that justice will be served. But the Armenian public remains skeptical: protesters again took to the streets on January 26 in the Armenian capital, Yerevan, to demand that Permyakov face trial in an Armenian court. Given the public wariness, the lingering questions surrounding the criminal investigation could become a political liability for the Armenian government. 1. Why Desert with Only a Gun and Bullets? Armenian investigators say that Permyakov left the 102nd army base in Gyumri at 4am on January 12 with an AK-74 rifle. Permyakov himself is reported as saying he went “to take a stroll.” Yet many question why Permyakov would choose to abandon his post with no supplies other than a gun and bullets. According to the government’s weather service, ArmHydMed, area temperatures on January 12 fell to 17 to 20 degrees Celsius below zero – a frigid low even for a Siberian native like Permyakov. 2. How Did Permyakov Enter the Victims’ House? The Avetisians lived in a gated, private house in the center of Gyumri, some three to four kilometers from the 102nd army base. Neighbors have told reporters that the family usually left the gate unlocked. A new, stronger door was purchased for the house two days before the murders. Armenia’s special investigation service claims that Permyakov broke a window to enter the house. The defendant says only that he wanted to drink water. He claims that he did not know the family, nor do the Avetisians’ relatives know of any previous ties. Investigators, though, have not disclosed any hypothesis as to why he chose this particular gated house in his alleged search for water. 3. If Permyakov Wanted Water, Why Not Just Ask? To many locals, long accustomed to sharing food and cigarettes with Russian soldiers, this is the strangest question. Permyakov was a recent arrival, but those posting on the 102nd base’s page on the Russian social network VKontakte speak openly about Gyumri traditions of hospitality toward soldiers in need. 4. Did Permyakov Encounter Resistance? In a January 17 interview with Aysor.am, Armenian attorney, Tamara Yayloian, who initially attended Permyakov’s interrogations, claimed that the soldier said that he had shot the first Avetisian, a man, when he reached for the phone after waking up, seeing him, and yelling. After hearing voices in an adjacent room, Permyakov alleges that he entered and killed two people there. He then supposedly moved into the third adjoining room, and shot dead three of its occupants and, when his gun misfired, stabbed six-month-old Seryozha Avetisian with his bayonet. A corridor connects all three rooms. To many, that raises the expectation that the occupants of the other rooms would have awoken at the sound of gunfire, and tried to stop the intruder, who would not have known his way in the house in the dark. Video from the crime scene, however, shows six of the seven family members dead in their beds. Some openly question if Permyakov acted alone, but no evidence exists to support such speculation. 5. Why Did No One Hear the Shots? The Avetisians lived in the center of Gyumri, a city of 146,355 people, on a street not far from the city hall and train station. Neighbors’ houses were just meters away. Yet, surprisingly, though investigators say they have interviewed 30 witnesses, no information exists about anyone who reported hearing gunshots or other commotion. In a country where people take a keen interest in their neighbors’ activities, this also arouses suspicions. Armenian investigators estimate that the killings occurred at about 6am – a time of day when, people could hear a pin drop in a neighbor’s residence, criminologist Sergei Galoian told a January 14 news conference. The Avetisians’ next-door neighbor, Rita Petrosian, a relative of the family, only discovered the murders around noon when she went to the house for a usual coffee. Official reports make no mention of a silencer. 6. Did Someone Tamper with the Crime Scene? Official reports state that military boots with Permyakov’s name in them, an AK-74 rifle with 5.45-milimeter bullets, a cartridge with 30 bullets and one with a single bullet were found scattered at the scene. Permyakov’s uniform was found carefully folded in the house. According to the official story, Permyakov left the Avetisians’ house dressed in the clothes of the owner’s son, Armen. An explanation as to why the suspect would be so careless as to leave behind such evidence remains unclear. 7. Why Did Nobody Notice Permyakov on the Run? While Gyumri may not be bustling in the early morning, a Russian man tramping solo by foot through the winter countryside toward the Turkish border is likely to have attracted someone’s notice. Yet no details have been given about the exact location of Permyakov’s arrest, how Russian border-guards recognized him, nor how, with a newcomer’s knowledge of the area, he made it to the border on his own. In Armenia, where coverage of crime scenes is video-rich, this absence of information appears anomalous. 8. Why Was Permyakov Not Tested Earlier for Mental Illness? On January 24, the Russian news agency Interfax cited an unnamed source who reported that tests will be run “in the nearest future” to assess Permyakov’s mental health, as well as to compare DNA samples. The tests will be conducted at the 102nd army base, according to the source. Reasons for waiting more than two weeks after the suspect’s arrest to perform such analyses were not provided. *Correction: Through an editorial mistake, this story earlier stated that two Avetisian children had been stabbed with a bayonet. In reality, only one, Seryozha Avetisian, was wounded this way. Two-year-old Hasmik Avetisian was killed by gunfire. The story has been ammended.